It’s an idea whose time had come. I had always wanted to be part of a wine club, one whose members were genuinely interested in wine and learning about wine, and one whose members would not be adverse to chipping in for very nice bottles. But for one reason or another the club did not materialize. The proximate cause can be defined as that which gave rise to the injury. For instance, if I accidentally push someone through a window, then the proximate cause of the resultant injury is my push. Okay, now that I’m done boring you, the proximate cause of the wine society was Kate M. sending out a Facebook invitation for the inaugural meeting of what has become dubbed the DC Wine Appreciation Society. There were various but-for causes, including a wine tasting I hosted for the staff of the Nota Bene last September at which Kate and Jill M., among others, were present. Before this I didn’t know Kate or Jill, and now they are two of my good friends. Through them I met a whole bunch of others, such as Kate’s boyfriend Rahul S. I also made the acquaintance of Giri I., another law student who happened to have substantial previous experience in the wine industry. Our inaugural meeting established the limits of membership as well as rotating system of events. (It also involved quite a lot of wine, naturally.) The first post-inauguration event, a Cotes-du-Rhone tasting, was hosted at Diane E.’s apartment rooftop. There were a number of excellent bottles: a few examples of Cotes-du-Rhone, some Gingondas, a CdP, and a bottle from a relatively new appellation, Vinsobres (the 2007 Domaine Constant-Duquesnoy). 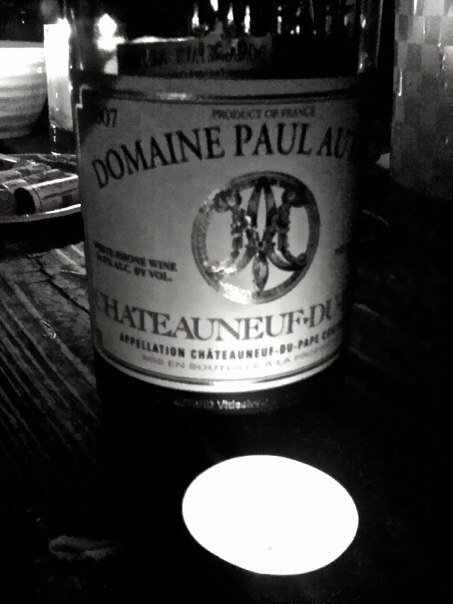 The standout, however, was a 2007 Chateauneuf-du-Pape blanc from Domaine Paul Autard. I’ve had it before and absolutely loved it. It consists of equal proportions of Grenache Blanc, Roussanne, and Clairette. It’s not inexpensive–Giri, Carl B., and I chipped in $22 each for a bottle–but it’s worth it. It’s a pretty dark straw color. There’s a nose of honey and lanolin, a hint of banana perhaps. It is full and generous, with nice weight in the mouth. Exceptional acidity and balance, redolent of roasted chestnut, citrus, and clay, maybe a bit of hazelnut or almond. Perhaps like a sherry. A nice roasted element melds with a crisp green element for a very complex and very long finish. It is perfect as an aperitif or as an accompaniment to chicken with mushroom cream sauce. It’s sort of an unusual bottle but despite its idiosyncrasies–or perhaps because of them–it was the most popular wine of the evening. Now with finals upon us, I don’t know the next time the full Wine Appreciation Society will meet. However, I am looking forward to next semester and the slate of awesome events we will be planning. ← New Article in the Palate Press! That’s interesting – American law treats this differently than Canadian (and English) law, where the issue is more one of looking at but-for in a proximity/remoteness analysis and then analysing policy reasons whether or not to establish the causal connection. The U.S. way seems strangely artificial and not really an accurate representation of the purpose of ‘causation’ – which, of course, is never a purely philosophical question. But, I suspect the policy analysis still happens in U.S. cases? The huge prevalence of civil juries is something I’ll never fully appreciate though. In any case, I am intrigued by Rhone whites and have loved a few examples. I hope to profile them at some point on the blog, finances permitting. I believe you have confused proximate cause and “factual” cause, my boy. (Much like everyone who read the opinion and concurrence in PALSGRAF v. LONG ISLAND R.R., at least in regards to terminology. As you may know, my collegue wrote with the same vocabulary as I, but to a different effect, creating great and unnecessary confusion.) Here, the push was the direct cause of the injury, not the proximate cause. Think again of poor plaintiff Palsgraf: the cause of her injury was the impact of the scales upon her frail body. The alleged proximate cause, which failed, was the efforts of the railway man who attempted to help the passenger into the car which caused the box of fireworks to fall upon the electric rail which lit the fireworks which knocked over the scales. Sorry, by “concurrence” I meant “dissent.” I’m getting confused in my old age. Dear Justice Cardozo: I never was much in the way of book larnin’.